Puddles Pity Party sings an emotional version of ‘Chandelier’ on America’s Got Talent Season 12 Auditions Premiere Episode on Tuesday, May 30, 2017. “You have so much talent. You are so much original,” said Howie. “It was very unexpected, very different. I wanna see more,” said Heidi. “I thought I saw everything on this show but you’ve come along and do this, and I loved it,” said Mel B. “I never want to know you because I have problems with clowns but I like you. This is originality at its best,” said Simon. Puddles Pity Party gets four yeses from the judges. He is moving to the next round of the competition. 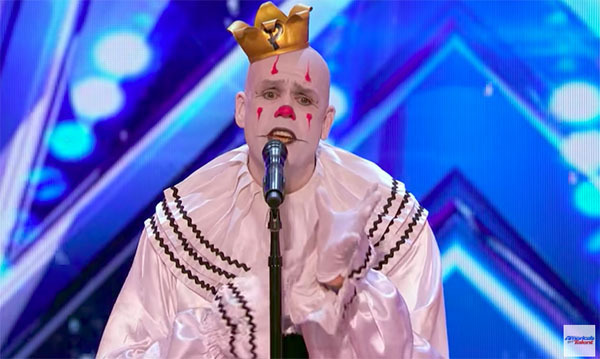 What can you say about Puddles Pity Party’s performance on AGT Season 12? Share your thoughts and views on the discussion box below.